• For quantitative determination of lactose and evaluation of drug effects on lactose metabolism. • Lactose (C12H22O11), also called milk sugar, is a disaccharide that consists of β-D-galactose and α/β-D-glucose through a β1-4 glycosidic linkage. Lactose is the major sugar and makes up 2–8% of milk. Simple, direct and high-throughput assays for lactose determination find wide applications. 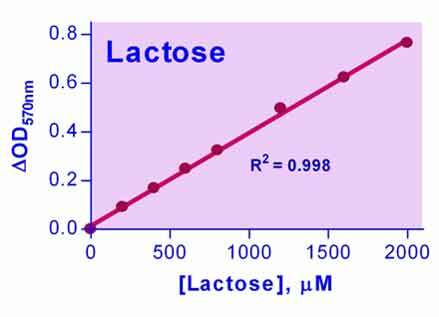 BioAssay Systems assay uses specific enzyme-coupled reactions in which lactose is cleaved and the resulting galactose forms a colored product. The color intensity at 570nm or fluorescence intensity at 530nm/585nm is directly proportional to the lactose concentration in the sample. 1. I would like to know if I can use the optical density at 540nm to read my samples. The signal at 540nm is only about 2/3 of the signal at 570 nm, but you still can use it. However, you will lose sensitivity. 2. Vabbilisetty, P and S Xue-Long (2014). Liposome surface functionalization based on different anchoring lipids via Staudinger ligation. Organic and Biomolecular Chemistry 12(8): 1237-44. Assay: Liposomes (Pubmed).